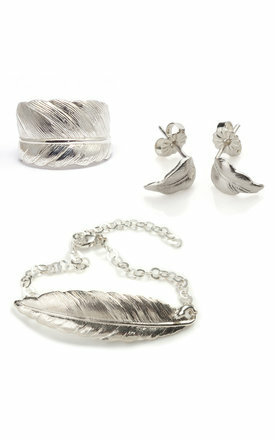 This silver feather jewellery set is elegant and comfortable. Suitable for everyday wear and special occasions. A stylish statement piece. - The complete set weighs 13.1g in total. - The set comes in a recycled matt black branded FrillyByLily box and two branded FrillyByLily foam and Perspex sliding boxes. - In small batches by experienced UK–based specialists, ensuring exclusivity, quality and strength. - Using metals that are 50% recycled as standard. We have this set in stock and available for immediate dispatch in UK ring size M. In all other sizes this ring is made to order, so please get in touch for a more accurate delivery date. We may not be able to offer a refund on rings that have been resized.